1. Click on the Create a New Account option under the Manage Admins menu. 3. 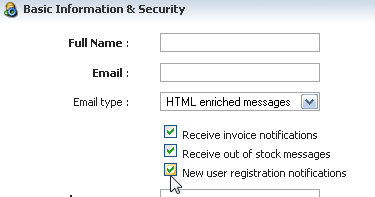 Select whether this new administrator will receive invoice notifications, out of stock messages, new user registration notifications or all by checking the appropriate boxes. 4. Enter a username and password for this new administrator. 5. Select the administrative privileges you would like to give this administrator by checking the box(s). 6. When you are ready, click on the Save Changes button to save the settings. You will get a confirmation meessage that the new administrator account has been successfully created.